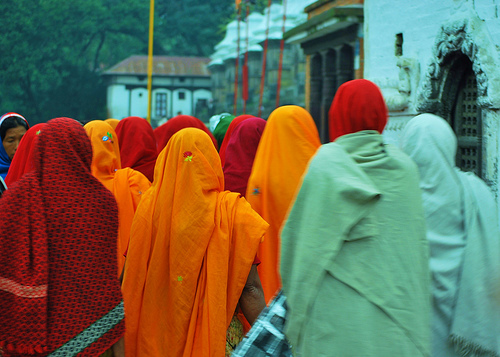 Description: Women in Hindu religion consider orange and red colours as a holy colours. These colours can be found to be used in various customs and religious ceremonies. These Indian pilgrims march towards the holy bank of river Bagmati. It is there where they along with many other hindu visitors take their holy bath before entering the Temple of Pashupatinath.